This post about Anthropologie’s late March sale contains affiliate links. Please read this blog’s disclosure post for more info. Anthropologie’s late March sale has perked up with some clothing fresh cuts! Best of all, sale is still an extra 25% off. I found some of my favorite items are on sale. There are not an immense amount of markdowns today. 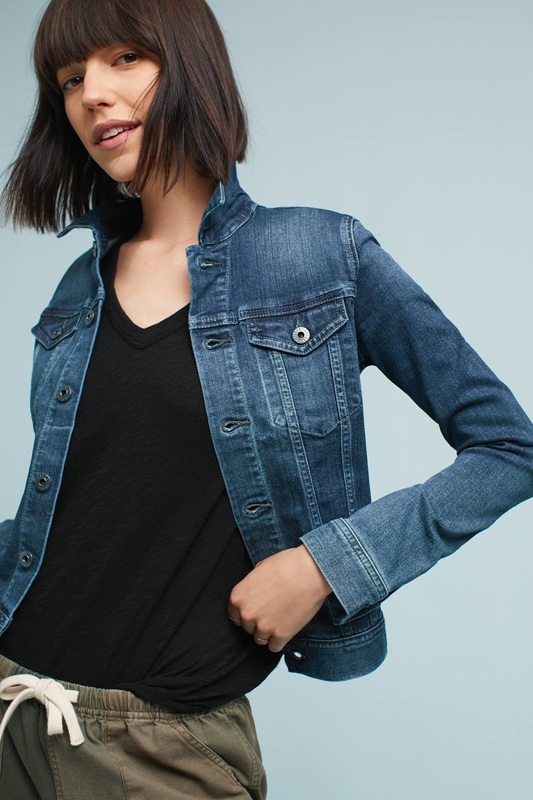 Firstly, I have to highlight the AG Robyn Denim Jacket (now $120 + 25% off, also in lighter wash). If you’ve followed this blog for any amount of time you’ve seen this jacket on me over and over in my outfit posts! I’ve had mine for many years now — at least six years. The quality is satisfying and the jacket is a classic look and cut that never goes out of style. I’m surprised that the lighter color, which is a bit trendier for 2018, hasn’t sold as well. Grab this jacket while you can! Not only is $120 a good price, but also at under $100 now, it’s a fabulous deal! The Audrey Fringed Linen Jacket (now $100 + 25% off) is also a great jacket. It’s a nice addition to Anthropologie’s late March sale! This fringed navy topper is basically a Chanel jacket at, oh I don’t know, one-fifteenth the usual price. Anthropologie kinda hid this one on their site. It looks quite lovely over the Striped Column Dress (now $100 + 30% off) but can also be worn over a white tee and jeans, or a blouse and slacks for work. Below, my picks from new + recent Anthropologie sale additions. I was curious about the fringed leather jacket. It’s actually fringed linen. You might want to correct that typo.